Interview with the Vocalist, Gordon "Spook" Stoker. I just thought I'd take a short cut through the local graveyard when I heard a moan by one of the tomb stones, as the hair raised on the scruff of my neck a familiar voice said, "'ere Sherlock's Dog fancy a chat?" S.D So Spook, what equipment do you fiddle with in the band? G.S I use a Shure Super 55 dynamic microphone, you know the "Elvis" type....looks and sounds good. S.D So when you're not barking at an audience what do you like to do? G.S I read a lot, classics like H.G Wells, Arthur Conan Doyle, Bram Stoker and modern fiction by folks like George Mann, Mark Hodder and Jonathan Green. I also enjoy history books, mainly social history of the 18th and 19th centuries, I've just finished a book on the London mob.....fascinating! 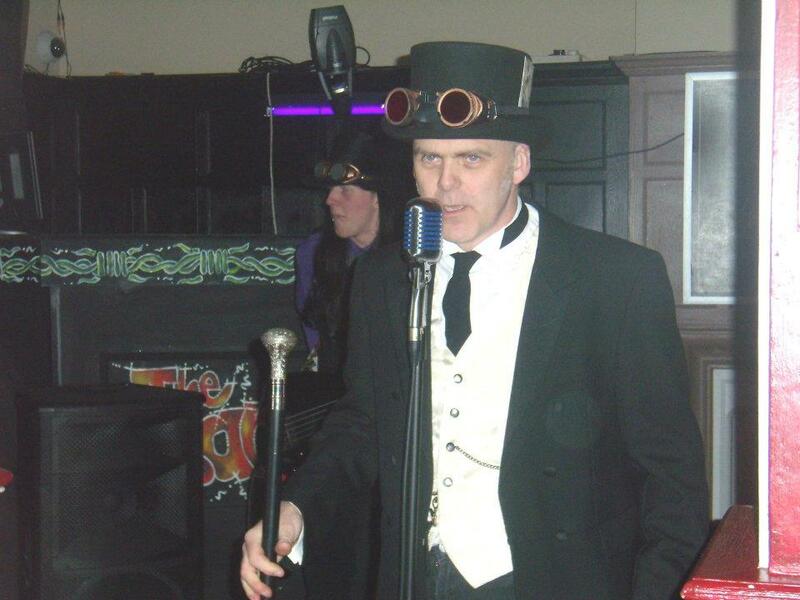 S.D What has been you're favourite Steampunk event to date? G.S Hhhhmmm that's difficult as I've been to some cracking places, playing at Steampunk Central at the Whitby Goth Weekend was a milestone for us and very exciting, also seeing Abney Park and Ghostfire in Oswestry then the November Nocturne the next day was incredible. Going to Steampunk events is, for me, like going out to meet old friends, every one is special and everyone is so friendly. S.D What bands have influenced you? S.D How about Steampunk bands? G.S The first Steampunk band I got into was The Men That Will Not Be Blamed For Nothing, I saw them in Birmingham and was very impressed indeed, BB Blackdog are a great band and a very friendly band, we've played with them 3 times now and enjoyed every one. I love seeing Ghostfire and I'm pleased Birthrite are back on track and gigging, it's good to see new bands emerging, I really enjoyed seeing Crimson Clocks recently. I take a lot of inspiration from singers like Paul Roland who I think is a genius and is quite rightly seen as a progenitor of Steampunk music, his lyrics are like stories that transport you to his world....superb. S.D What got you interested in Steampunk? G.S I first saw Steampunks at the Whitby Goth Weekend in 2010, I was there with my son Richard and was intrigued, so I went home and "Googled" it, I've never looked back! It is odd that I seem to have always been a Steampunk but I didn't know there was a name for the interests I had in the Victorian era but after speaking to other Steampunks they tell the same story, it's as if there was a scene just waiting to happen. S.D Right! I'm tired of hanging around in this graveyard I'm going home, what would you say to someone just starting out as a vocalist? G.S Just do it, you don't know what you can do until you try. It doesn't really matter if you're not an opera singer if your voice fits the music and you're having fun then just go with it and see what happens. In the words of the Rocky Horror Picture Show "Don't dream it, be it."